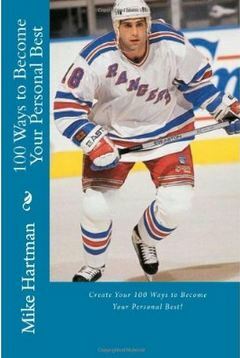 Former National Hockey League grinder Mike Hartman has released his own book. And it's not exactly the type of book you might expect from him. 100 Ways to Become Your Personal Best: A Motivational Life Coaching Blueprint is Hartman's list of 100 guiding principles that helped him attain my dream. And he wants you to help develop your own 100 Ways and achieve your dreams, too. Throughout my career as a professional hockey player, I benefited from having great coaches and mentors. Combined with my strong drive to improve my game no matter what it took, these coaches and mentors were able to make me a better hockey player and a better man. In my book, I tell my story and how I distilled those years of coaching and mentoring down to an essential list I call my 100 Ways to Become Your Personal Best. Combining lessons learned from mentors, coaches and players, along with observations and insight gained through just talking with folks through the years, I developed a fantastic step-by-step guide to becoming your personal best called the Better Life Training Playbook for Life.